Over the past month, BHP teachers and their students at Muscatine High School played the World Zones Game from Unit 8, Expansion & Interconnection. As an instructional coach, I had the opportunity to work on the game with two of these teachers and discuss the process with a third. Below are some twists we made along the way, teachable moments we ran into, and some pics and attachments from our work. Thanks to our BHP teachers: Michael Clancy, Rachel Hansen, Adam Wiley and Andrea Wilford. Each teacher played the game at different times and in different ways. This provided us with a variety of lessons learned and confirmed BHP’s ability to adapt to a variety of teachers and classrooms. Try using this virtual dice. This greatly increased the speed of gameplay, but did require at least one computer in each group. We created a score sheet that awarded zones for their resources over time, much like the U.S. continues to benefit from fertile agricultural land. The score sheet also allowed population to compound from round to round. Each teacher played around with group sizes. One class went with four large zones, fitting nicely with the Four World Zones article. The game was easier to manage with these large groups, but some students were able to tag along without much engagement. Another teacher used groups of 2-4 students. This kept all students engaged, but led to messy gameplay. More important than the logistics and accounting of the game, designing your game to build in and allow teachable moments is key. Give each team an opportunity to answer all trivia questions. In Andrea Wilford’s class, these became quick discussions between rounds and teams had to form consensus. Take a few minutes to discuss and rank the innovations on the cards. Students had a better understanding of their points after discussing and contextualizing these social and technological developments. Have your students journal throughout the game. Rachel Hansen’s students reflected at the beginning, middle and end of their game. 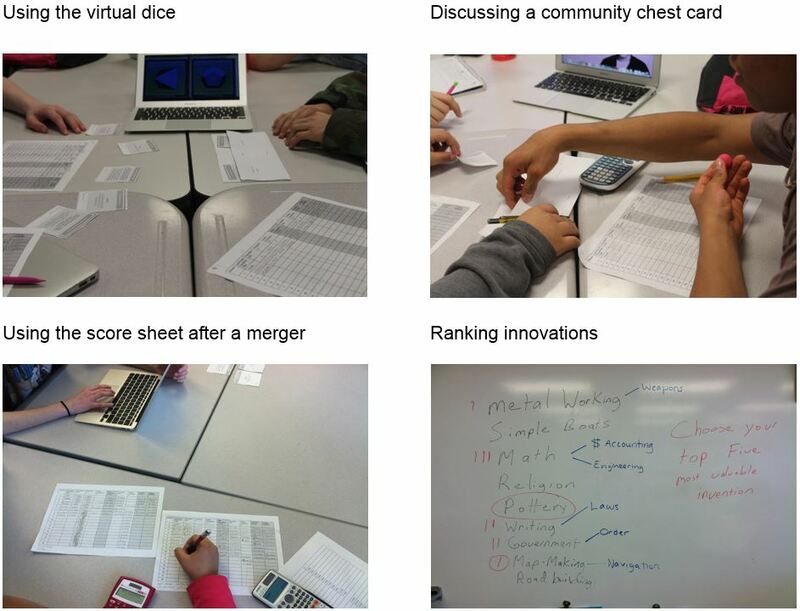 She encouraged students to think about their resources, population changes, and mergers with other zones.